This listing is for the Jacket only. This is a new item that has never been worn.The size is an Adult Medium. 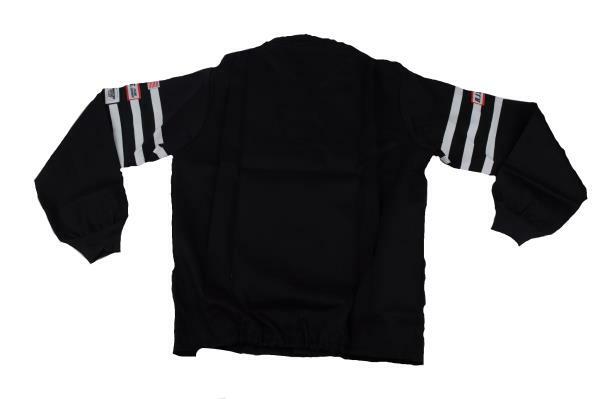 This Jacket is Black with three White Stripes that go all the way around the arms. 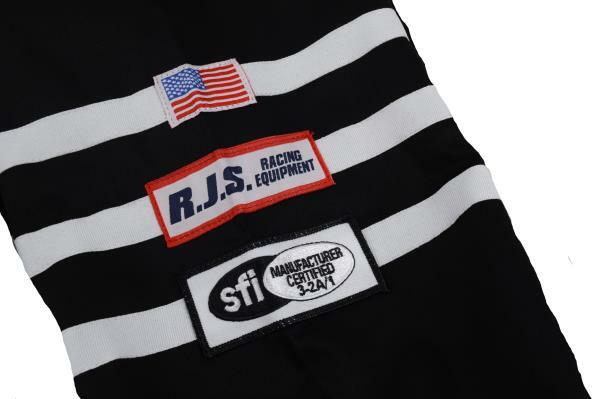 On the left arm is the single layer SFI 3-2A/1 Tag, the RJS Brand logo and the American Flag as it is proudly "MADE IN THE U.S.A" The left arm also carries the RJS Racing Equipment badge. 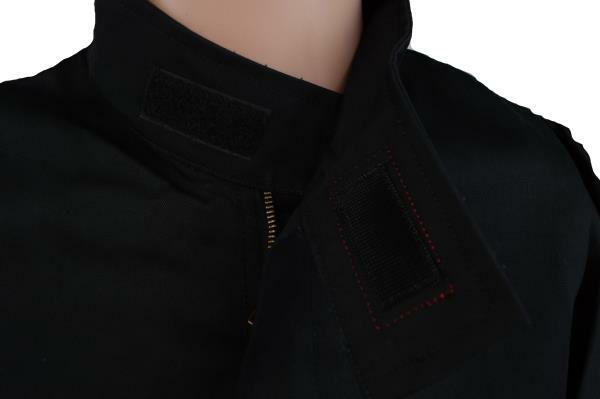 The fire suit jacket is sewn with a pleated flexible back so you can sit in a vehicle comfortably and also have more dexterity of arm movement. 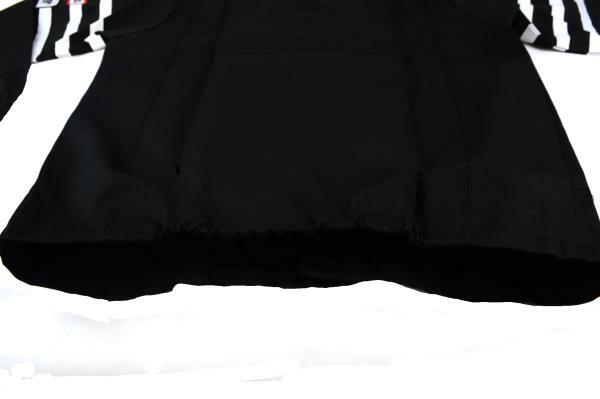 This Item is also made with an elastic bottom edge and a Velcro neck collar that is secured after it is zipped all the way up. Please remember this is a Racing Driving Fire Suit and not your cold weather coat. It is designed differently and made specifically for Racing and your safety so you can go home after the track to your loved ones and race another day. 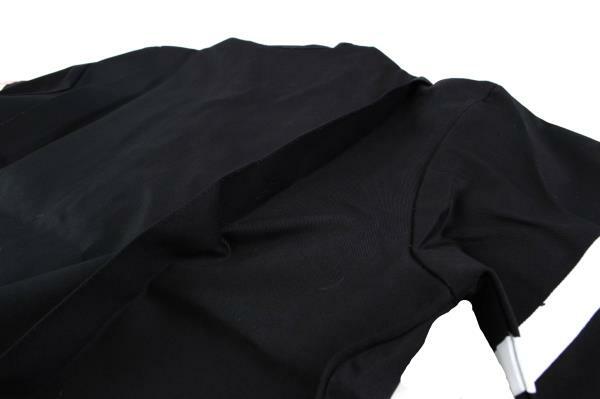 This Jacket is made of a treated Flame Resistant Cotton which is much lighter and actually breathes when it is not exposed to a high heat source or fire. 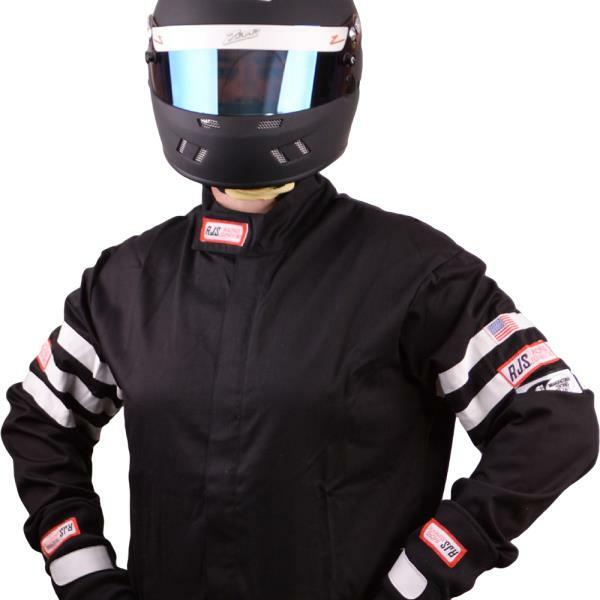 This is a much more enjoyable material and better protection from those full Nomex suits from years gone past. The chemical used to treat this material when exposed to high heat or fire, causes its molecular structure to close protecting you from serious bodily injury from burning. 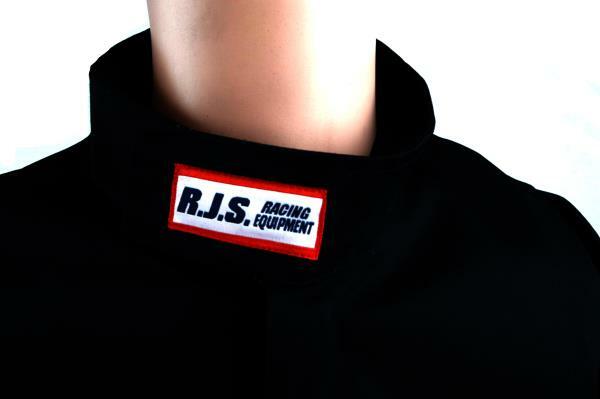 All RJS fire suits are sewn with Nomex Zippers, Nomex thread and Nomex Cuffs for extra protection and durability. These fire suits exceeded SFI testing and their TPP Rating for a single layered item. This item is manufactured by RJS Racing Equipment out of The Motor City since 1959. 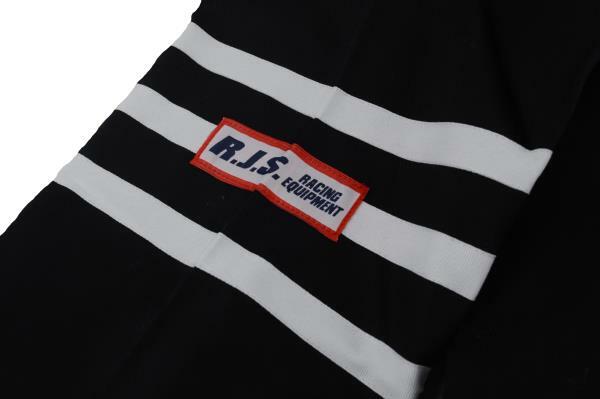 RJS was one of the first American Companies making Racing Safety Fire Suits over 50 years ago, long before all the others came into the market with cheap foreign products that are seldom or not tested by SFI and carry a bootlegged SFI Tag so don't be fooled. RJS is one of the last American companies still offering American made products to the world. Spend the extra few bucks and buy a legitimate, repeatedly tested American Product that keeps Americans employed and will actually perform the way it was designed to do. Don't risk your safety ! We stand behind what we list. We offer a one year warranty from the date of purchase with proof of purchase. Returns are also accepted within 30 Days. We usually ship within 24 hours. Yes we will combine shipping on most items. We do NOT ship "Free" Internationally. We will ship internationally. All items exact weight and dimensions are listed within the listing, so the shipping cost you see on your end is accurate based on USPS Priority International rates. Please message if you would like us to quote for international shipping on multiple items. We package everything extremely well so it will arrive to you safely. Please notify us within 24 hours if you receive a damaged item and save all the packaging materials. Everything we list is in stock and sitting on a shelf in an air conditioned environment, so if you need something overnight we can make that happen. We do not "Dropship" any of our listed eBay items through vendors. Items are sitting on our shelves. If you do not see an item listed within our store, please feel free to send us a message. More than likely we have it. If you have any questions, or would like additional photos, please feel free to ask. We want you to be happy and pleased with your purchase. In the event that you are not, or have any issues after receiving your item, please send us a message directly and we will come to a resolution. It is important to us that you are satisfied. Thank you for looking. By Ben Whitworth First Official Pictures 04 November 2008 10:30 Mercedes set an all but impossible challenge for tuners at this year’s SEMA (Specialty Equipment Market Association) show in Las Vegas – to turn its gut-wrenchingly ugly GLK off-roader, which makes its formal American debut at the show, into something desirable and cool. The best four submissions – the Brabus Widestar, Urban Whip, Pikes Peak Rally Racer and Rock Crawler - were displayed at SEMA. And presumably scared a lot of showgoers senseless. The sub-comp[act SUV Vauxhall Mokka is now on sale in the UK in three trim levels with a choice of three engines from £16,995. First customer cars in November 2012. The official debut for the Vauxhall Mokka (which retains the German spelling of 'Mocha' for its name) was the 2012 Geneva Motor Show in March, although by then we already knew what was on offer. That's because not only had Vauxhall / Opel divvied up photos of the Mokka in January, we'd also had the Buick Encore revealed in the States which is, to all intents and purposes, a Mokka with an Uncle Sam badge. By Ben Pulman First Official Pictures 15 July 2008 10:42 Mazda will use the August 2008 Moscow motor show to unveil its new crossover concept, the Kazamai. Japanese for ‘swirling crosswinds’, the Kazamai is Mazda’s latest concept car to showcase the company’s Nagare design language. But alongside the wind-inspired looks, the four-wheel drive Kazamai is also said to showcase Mazda’s ‘sustainable zoom-zoom’ strategy, with the company’s latest-generation engine and transmission.